Need the perfect pizza recipe? 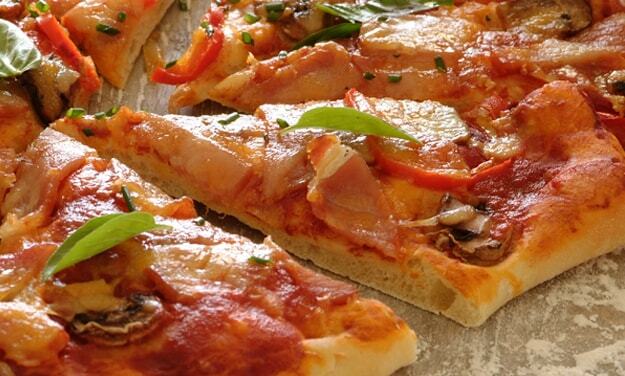 Try this delicious homemade pizza recipe for the most wonderful meal today. Stork – Love to Bake. Mix the first three ingredients in a bowl, sprinkle with some flour and leave to froth. In another bowl, mix together the remaining ingredients and then add the yeast mixture. Stir with a spoon then turn onto a floured surface and knead for 5 minutes, adding a little flour if it is too sticky. The dough should be soft but not sticky. Place the dough in an oiled bowl, cover with cling wrap and a cloth and leave in a warm place to rise and double in size. Once risen, place on a floured surface and knock back and knead lightly. Divide into 6 equal pieces and roll each piece into a round shape about 5mm thick, and place them onto greased oven trays. Spread all the pizza rounds with the tomato puree using the back of a dessert spoon. Decorate with the desired toppings then sprinkle with mozzarella cheese. Bake in a preheated oven at 180ºC until the edges are golden brown (about 15 minutes).